Sunday July 4th 1926 I wrote Lydia and Mabel McDougall in the AM. Mrs Moore away. We both rested in afternoon. After supper Hattie & Cora came for me to go to Byingtons. Spent a pleasant evening on the porch with Ott & Fannie. Monday July 5th 1926 I came down to Hatties early. Was fixing a sweater I bought. Cora took us to the station in the afternoon to say good-by to Ott & Fannie. She goes to Colorado and he on to The West Coast. We brought the baby home with us. Mary come for him later. very warm for the three days. 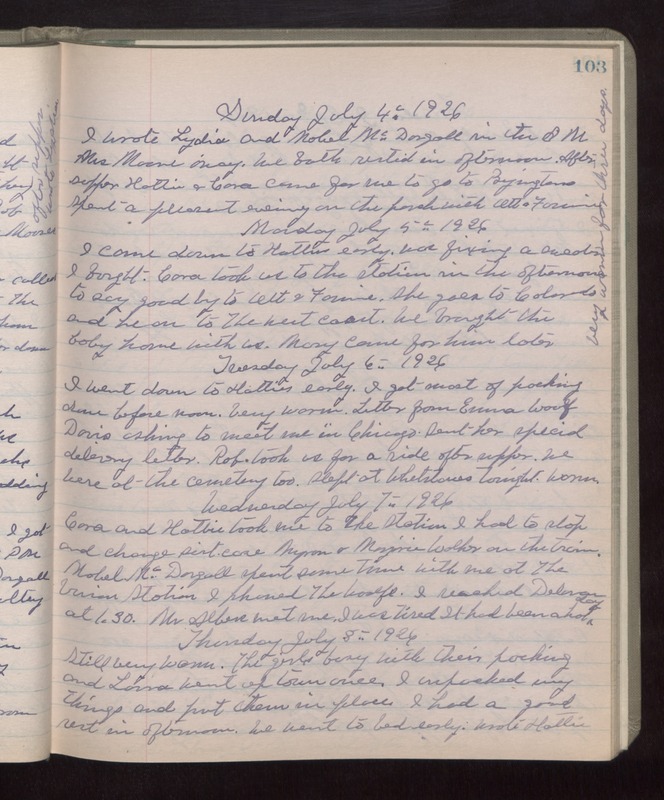 Tuesday July 6th 1926 I went down to Hatties early. I got most of packing done before noon. Very warm. Letter from Emma Woolf Davis asking to meet me in Chicago. Sent her special delivery letter. Rob took us for a ride after supper. We were at the Cemetery too. Slept at Whetstones tonight. warm. Wednesday July 7th 1926 Cora and Hattie took me to The Station. I had to stop and change suitcase Myron & Marjorie Walker on the train. Mabel McDougall spent some time with me at The Union Station. I phoned The Woolfs. I reached Delavan at 1.30. Mr Albers met me. I was tired. It had been a hot day. Thursday July 8th 1926 Still very warm. The girls busy with their packing and Laura went up town once. I unpacked my things and put them in place. I had a good rest in afternoon. We went to bed early. Wrote Hattie.